I write for a living. When I’m not writing books and articles, I am writing notes for future books and articles, or I am writing emails and reports, or comments on my students’ work. And, for the last 20 years, I have been doing almost all of that on a computer, mostly a desktop PC. Like everyone else in the world (with the possible exception of members of an isolated tribe in the New Guinea highlands who have yet to see a white person, other than Lady Gaga), I have been reading reports of the death of the PC for the last couple of years. Apparently sales are plummeting because everyone is buying tablets. Now, I’m a man who likes a nice gadget and my curiosity usually outweighs both my commonsense and concern for the environment. Also, I have a new role at work, which involves going to a lot more meetings. I make notes in these meetings, using a pen and paper (younger readers, if any, may wish to research those terms), which is quick and easy, and doesn’t distract me too much from what people are actually saying in the meeting. The problems begin when I try to find my notes later so as to remember what I had promised to do in respect of the various “action points” that arose. At times my aching eyes, back, neck and arms lead me to suspect that I spend too much time sitting at a desk in front of the PC. So, to try and vary things. For example, when I’m reading for research I sit in a nice comfortable armchair, or stretch out on the couch, with a book or a print-out of an article that I’ve downloaded, a pen, and a pad of Post-It notes. Much nicer. But when I’m done reading I have to go back to the computer and type up my notes, otherwise I will eventually lose the book or the Post-It notes fall out. And there are other problems. I was re-reading my copy of J.B.S. Haldane’s Daedalus, or, Science and the Future (1924) in preparation for a class a few weeks ago. At one point, Haldane comments that “To light a lamp as a source of light is about as wasteful of energy as to burn down one’s house to roast one’s pork”. Attached to this is a Post-It note on which I’d written “roast pork”. – Elia (Charles Lamb) – also mentioned by J.S. Huxley”. Well, as Robert Browning almost said, when I wrote that only God and Jim Endersby knew what it meant, but now, only God knows. In slightly over five decades of fairly steady (albeit uneven) use, my brain seems to have developed a few bald patches, where it no longer grips as it once did. Colleagues comment approvingly on how quickly I reply to emails, but the truth is that if I don’t do things immediately, I forget to do them at all. I rely increasingly on the computer to remind me of things – names and dates and my friends’ children’s birthdays. And my assumption is that this need will become greater in time. So, a few weeks ago, after much research, I bought myself a tablet computer and ended up with a Microsoft Surface Pro 2 (slightly to my surprise). Anyone who does a lot of writing with a computer and wonders how much of it you might do with a tablet (any why you might want to switch), may be interested to know how I arrived at the choice, and what I think the pros and cons of this tablet (and, to some extent, tablets in general) are. We already have an iPad in the house; the kids love it, especially because they can make movies on it; iMovie and Edumotion (a very simple, easy-to-use stop-motion animation program) are wonderfully easy to use and the business of making visual content is genuinely intuitive, especially for the “pointer” generation (see Jennifer Egan, A Visit from the Goon Squad. Great book.) However, the iPad is visual; when it comes to words, it is mainly for consuming rather than creating them. Personally, I find the little on-screen keyboards on gadgets like this an absolute pain. You could, of course, buy a little tiny (and fearsomely expensive) Apple keyboard, which gives you a little tiny (and fearsomely expensive) laptop, that is woefully underpowered and awkward to use. No thank you. I have a laptop and when I want to use a laptop I prefer a 13” screen and a full-sized keyboard. However, the problem with laptops is that the screen is too close to the keyboard, which exacerbates the neck-ache problem. This is a technology, like the PC itself, that bends you into an odd shape so that you can use it. Apart from my “real” PCs (laptop, home and work desktops) the gadget that I use most is my phone, a Galaxy Note II, which is expensive – especially for someone who rarely makes phone calls. But I use it everyday as a diary and to check emails. It synchronises all my appointments and my address book with my other computers and the screen is big enough that I can actually read it (my eyes, like the rest of me, are nearly 53 years old, and my relatively new varifocals make reading most phones a challenge). However, the really exciting feature about the Note that it has a stylus. Steve Jobs (“Most overrated individual in history?”, discuss.) once famously said that “if you see a stylus, they blew it”. A comment aimed at the old enemy, Microsoft, who introduced their tablets and “pen computing” platform back in 2000. When it comes to styluses, I beg to differ (and when I’m as rich and famous as Steve Jobs was, no doubt people will actually care what I think). I simply cannot write emails or texts on a phone-sized screen using their on-screen keyboards (not, at least, at anything like the speed I can think. Even though that’s slower than it used to be). But I can write with the Note’s stylus and it does a pretty good job of turning my horrible, illegible scrawl into recognisable text. (Especially if you replace the installed Samsung handwriting recognition app with MyScript Stylus which, even though it’s still in beta, does an even better job.) Thanks to the Note and its stylus I can sit on the couch, read my emails and write short answers, instead of having to go upstairs, switch on the PC, wait, and then spend even more of my day sitting at a desk. The only problem with the Note is that the screen is too small for extended writing. For a phone that I mostly use as a diary, it’s a sensible compromise, but it made me think that maybe I needed something larger. My first thought was simply to buy a bigger Note; Samsung make 8” and 10” versions of it. I played with both (thanks to PC World, almost the only shop in Britain that has working versions of the gadgets it sells on display, so you can actually try them). I was not persuaded. The 8” is too small and the screen resolution of the 10.1” seemed a bit too low (everything looked fuzzy). Samsung announced a new 2014 edition a couple of months ago. It took me weeks to find one and I was disappointed; fairly expensive, the handwriting recognition didn’t seem to work as well as the Note II (maybe it just needed some tweaking, and of course in the shop I couldn’t install MyScript Stylus). But the bigger problem was that the tablet (like the phone) runs Android. Both Outlook and OneNote run on some Apple gadgets, but you can’t get the full versions on iOS, which is what the iPad runs, and the iPad doesn’t have a stylus. You can, of course, buy a stylus for an iPad, but that would be a capacitive stylus, which means it’s basically a big, fat, artificial finger. The Samsung Note’s stylus is an active digitiser. You can learn the difference (and why it matters) from a nice clear post on Michael Linberger’s Blog, but basically an active digitiser is more accurate, it will detect your palm (and ignore it), so that you can rest your hand on the touch screen while you’re writing, it has a fine tip that produces nice, fine lines, and – if you’re at all artistic – they’re usually pressure-sensitive, so if you have a suitable application you can press harder to get heavier lines, etc. For me, though it’s the accuracy that matters: effective handwriting recognition relies on it. So, by this stage I realised that I wanted a tablet with an active digitizer, a 10” (or better) high-resolution screen, and I wanted to run Outlook and OneNote, which meant I would have to buy a Windows tablet. That left me with five choices: Microsoft’s Surface; Sony’s Tap 11; Lenovo’s ThinkPad Tablet 2; or, the newly announced Dell Venue Pro 11. Sony is as expensive as the Surface but has slightly worse specifications, comes with a detached (and largely useless keyboard), and is rather flimsy. Reports of the active digitiser are mixed. ThinkPad is too old, has a low-res screen, and there’s no sign of a new model. Dell looks very attractive but not yet available in UK and I was in a hurry. It may be worth checking out. So, that left Microsoft. There are two models: the cheaper is the Surface 2 (which runs what was called Windows RT, but Microsoft is now so ashamed of it that it seems to be OSWAN, the Operating System Without A Name). Much has been written about the pros and cons of the Surface 2 and it’s anonymous operating system (most of it fairly negative), but for me it was a non-starter because it doesn’t have the active digitiser. The digitiser is an absolute delight. Almost 20 years of typing on computers has destroyed my handwriting (and it was never great, as my primary school teacher, Mrs Worcester, used to constantly point out; she had an enlarged photograph of Queen Elizabeth I’s stupendous, italic handwriting on her classroom wall to inspire us. Didn’t work for me. Perhaps my lifelong aversion to our monarchy put me off.) I can no longer read my own writing, but more importantly, I cannot quickly search piles of hand-written notebooks (especially after my kids have “enhanced” them in various creative ways); as a result, I often cannot find the crucial note I need. ( Thinking back to undergraduate days, that was why I spent two days at the Sydney Workers Educational Association learning to touch type in the first place.) The Surface recognises my handwriting, and it did so straight out of the box, but better still it “learns” over time, so the number of corrections gradually reduces. You can also spend time training it to improve its accuracy faster. Size, weight and battery life are all acceptable, but not wonderful. I can comfortably rest it on a lap or knee while writing and it doesn’t get too hot. It feels robust and solid enough to carry around and while I wish it was lighter, it’s only half the weight of my ultrabook (a Dell XPS 13, so it’s pretty svelte). The best thing, however, is how you can use it. When I take it to meetings , I can pre-load load the agenda and minutes onto the tablet beforehand (less paper to recycle afterwards), then make notes of any key points during the meeting. I do all this in OneNote. Thanks to the magic of SkyDrive (and the fact that I work in a modern university with wifi in almost every room) by the time I get back to my office, my notes have all been synchronized with my desktop PC and I can look through the things I agreed to do, and just drag and drop an item onto my Outlook task list, or turn it into an email. No retyping, no searching my notes, no losing the printed agenda on which I had scrawled “must email Bill about this”. There is also something minor, but – to me – rather lovely about the way the tablet affects my body language. When people use a laptop in a meeting, I feel as though they are not quite there: they’re “hiding” behind the upright screen, not listening to me (and possibly checking their emails or playing Solitaire). But a tablet can be almost flat on the desk, like a real pad of paper, which makes you look (and feel) as if you’re really part of the discussion. A small thing, but I like it. My second main use for the tablet is annotating and commenting on PDF files or other documents. I do this more and more, partly to save paper and partly to be able to find my notes. I like to write on students’ work, for example. But if I print it out and write on it, they can’t read my writing, I have to get the physical bit of paper to them, which leaves me with no copy of what I wrote. If I work on the electronic version (which is how most student work arrives these days), I can annotate it (and handwriting recognition means they can read it), keep a copy and email the comments to the students. For PDF files, I use Adobe’s Acrobat Pro XI (again, tried other things but this is best; as long as you’re only paying the educational price). For Word files, I just use the built-in comment and “track changes” features. Neither is perfect, but they are each a big improvement on the hand-written alternative. Similarly with research notes; I can save them and search them at a later date. And it means I can take any number of documents with me on a train, plane or to a café. Read them. Make notes. And once I’m back in range of wifi my notes are all synchronised and available on my other computers. My third main use for the Surface is to make notes when I am reading an actual physical book. Instead of having to prop the book up on a stand by the PC and give myself a crick in the neck twisting from book to screen and back, or use great handfuls of Post-It notes, I can now sit in an armchair, book in hand, tablet beside me and use OneNote to make notes as l go along. Not only can I read and search my notes, and copy key points into my documents, but l am already saving a lot on Post-it notes. Obviously, since the Surface costs £799 I will have to save a lot of Post-it notes before the gadget pays for itself. And then there’s the electricity. And the broadband. But as I plan to live to be about 150 and to read a couple of books a day, getting through at least 100 Post-It notes per book, l figure I will come out ahead. Just. And, of course, the Surface also does email and web browsing, reads ebooks, etc. And apparently you can even play Solitaire on it. Not that I would know, of course. So much for the good news. The not-so-good is that the Surface a classic Microsoft product, which means it’s trying to be all things to all people, which really means that you have to learn to do everything the Microsoft way. (Not for nothing is the company HQ’s official address “1 Microsoft Way”.) The Surface runs Windows 8.1 (pictured) which, in true Microsoft style, is both a dessert topping and a floor wax. You and I might think that it would be sensible to make two versions of Windows: a desktop version for large, non-touch screens that is designed to be used with a keyboard and mouse. (In which, for example, programs are represented by small icons, so that you fit lots of them on your big screen.) And we would produce a separate version for tablets that is designed to work with a finger or stylus. (In which, for example, programs are represented as nice big squares, that are easy to prod with your finger.) Well, you and I might think that, but that’s why will never work for Microsoft. At 1 Microsoft Way they follow the One Microsoft Way, which says that not only does Windows have to run on everything, but it has to be the same version of Windows on everything. I don’t understand why, but perhaps that’s why I’m not a multi-millionaire like Bill Gates. Sadly, the one-size-fits-all philosophy infects the rest of the Surface too. In many ways, it’s a beautifully designed piece of technology, but it trying to both a full-blown laptop and a tablet. And so it is a rather unhappy compromise. With the attached Type Cover (another £100, pictured) you have a rather unsatisfactory (and small, and overpriced) laptop. Without the keyboard you have a lovely tablet, but it’s a bit too heavy and hot, etc, and – depending on how you use it – it will only run for about 5-6 hours on its battery. 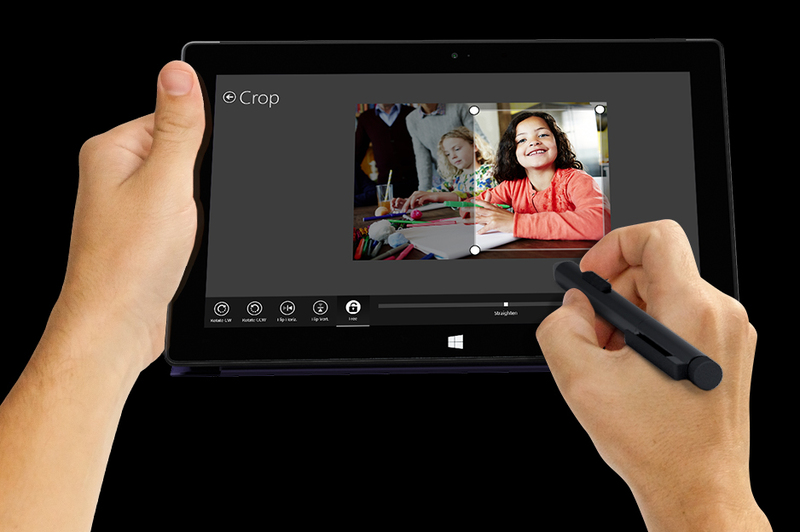 What is more irritating, is that the stylus integration and handwriting recognition could have been even better, if Microsoft had focussed on making a perfect tablet instead of a slightly uncomfortable hybrid. For example, the handwriting recognition relies on a pop-up panel, but it takes up too much of the screen and it isn’t adjustable. At all. It should be possible to make it smaller (and semi-transparent) so that it doesn’t – for example – completely cover the web form you’re trying to complete. Nor does the pop-up appear automatically whenever you click a text box that required text input. How hard could that be? And, while, I’m whining, why does the OneNote app (i.e. the version that is supposedly designed for tablets) not allow you to simply write on it and recognise your writing? Instead, when you write you get a picture of your handwriting without even the option of converting it to text. This is seriously dumb. As a long-term user of Microsoft products, I often wonder if anybody in the company actually uses them. Yet, despite my complaints, I am almost in love with my Surface. Why? Because, unlike almost all the gadgets I own, or have ever owned, I feel it is adapting to me, rather than my having to adapt myself (and my aching back) to the technology. This gadget actually makes life easier, for me at least. Obviously, it’s a device that is still evolving. I dream of a Surface 3 that weighs about 300g less, is about half as thick, runs for 10-12 hours on its battery, and has a 12” screen. It would also have the option of built-in 4G mobile networking. And a slot in which to store the stylus. Oh, and it would run “Windows Tablet” which combines the best features of Windows 8.1 with the best of Windows Phone. And please could mine be purple (the whole “any colour as long as it’s black” thing is so 1908). But, in the meantime, the gadget and l are pretty happy together. Well, not a perfect prediction, but close. The SP3 is only 100 g lighter and a third thinner than the SP2, and gets about 7-8 hours of battery life. The 12″ screen was spot on, but there’s no 4G option nor a slot for the pen. I live in hopes of the Surface Pro 4 meeting my dreams, but in the meantime, the Pro 3 seems like quite a big improvement.